The majority of automated manufacturing assembly processes require the reorientation or “picking and placing” of parts at least once.Examples include parts being loaded into an automated assembly machine, or components requiring machining with automated loading and unloading. Nearly all consumer items require packaging at some point in the manufacturing process, and generally these operations employ either pneumatically or electrically powered grippers. In order to design a well-functioning automated process, the machine designer must select and size a gripper. The first decision the machine designer must make is whether to use a traditional pneumatic gripper or an electric gripper.Pneumatically powered grippers have been commercially available for a few decades, and their sophistication and capability have improved dramatically over the years. Early gripping mechanisms were designed and built by machine builders utilizing a combination of pneumatic cylinders and external tooling customized for each individual application. The maturing of this market and the versatility of today’s products allow for a wide selection of types and sizes for machine designers. Today, the market is certainly growing for electrically driven grippers. Recognition of the total cost of compressed air, along with a desire for better motion control, has caused many companies to pursue more electrically powered devices as a solution to their automation needs. The number of different electric grippers is increasing, but still lags considerably behind their pneumatically powered counterparts. While the cost of electric grippers continues to drop, the grip force per dollar cost and grip force to unit size still both favor the pneumatically powered types. Next, a decision must be made to determine how many jaws will be required. Will the solution require two jaws, three jaws, or more? The vast number of applications can be accomplished with a two-jaw gripper, which can be easily tooled to accommodate square, rectangular, round, or even irregularly shaped components. A three-jaw gripper can be tooled to grip round or irregularly shaped parts, but is not well suited for square or rectangular parts. Very rarely is there a need for more than three jaws. A big consideration is cost and availability of devices offering more than two jaws. Along with the number of jaws, the designer will then decide whether the application needs an external or internal gripping motion. Due to piston rods attaching to mechanical linkages or cam configurations, many pneumatic grippers will have higher grip forces in one direction than the other. Or they may include a specific option designating higher grip force in one direction versus the other. The next consideration is usually jaw motion. The difference between the two motions is the way the jaws travel with respect to each other and the way their gripping faces relate to the parts being gripped. Angular grippers have jaws that pivot from the body of the gripper and travel through an arc until the tooling encounters the part. 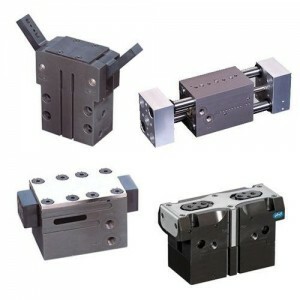 Parallel grippers have jaws usually at right angles to the body of the gripper, and travel through a common parallel plane until the tooling meets the part.